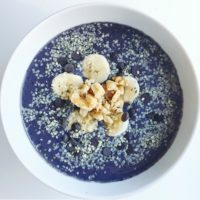 With spring comes warmer weather, more sunlight and the return of outdoor fitness – the perfect excuse to try this smoothie bowl made with all the purple goodies. It is packed with high digestible value (the amount that is absorbed) and biological value (how much is available for use once absorbed) protein thanks to plain Greek yogurt. Dairy foods, like yogurt, cheese, and milk, are high-quality protein sources that provide all of the essential amino acids, the ones your body can’t make. Chia seeds, ground flaxseed or hemp seeds – all which provide a great dose of plant-based omega-3 fatty acids. Old-fashioned oatmeal on top to provide a complex-carbohydrate – great source of sustained energy released slowly to your body and fiber to slow down digestion. Nuts (almonds, walnuts, crushed pecans) or a dollop of almond butter – heart healthy fats that can provide additional satiety, so you aren’t hungry an hour after eating. Dark chocolate pieces – full of flavanols that help the heart pump blood more efficiently by dilating arteries. Give this smoothie bowl a try after a strenuous workout – it provides necessary carbohydrates to replenish your energy stores and protein to assist in muscle recovery and repair. Not only is packed full of vitamins and minerals, but it tastes delectable as well! Toppings: Pick your favorite super foods! Some options include sliced banana, walnuts, chia seeds, hemp seeds, ground flaxseed or dark chocolate pieces. To a blender, add juice, water, yogurt, and fruits. Blend on high speed for 30-60 seconds or until mixture runs smoothly and is completely mixed. Pour into two bowls and add your toppings. Follow us on pinterest, facebook, twitter and instagram for daily food and fitness inspiration! « How Much Exercise Do You Really Need?